1In a medium bowl, stir together the flour, rice or potato flour and salt. Add the kimchi, kimchi juice, egg and green onions (I like to save a few green onions to put in the dipping sauce) and stir just until well blended. The mixture will be a beautiful salmon colour. 2Heat a heavy skillet over medium-high heat, add a drizzle of oil and cook the mixture in large spoonfuls, flattening them out like silver dollar pancakes, or cook half the batter at a time, making two large pancakes. Cook until golden and crisp on the bottom, then flip and cook until golden on the other side. If you made large pancakes, cut them into wedges. 3To make the dipping sauce, put all the ingredients into a jar, seal and shake it up. 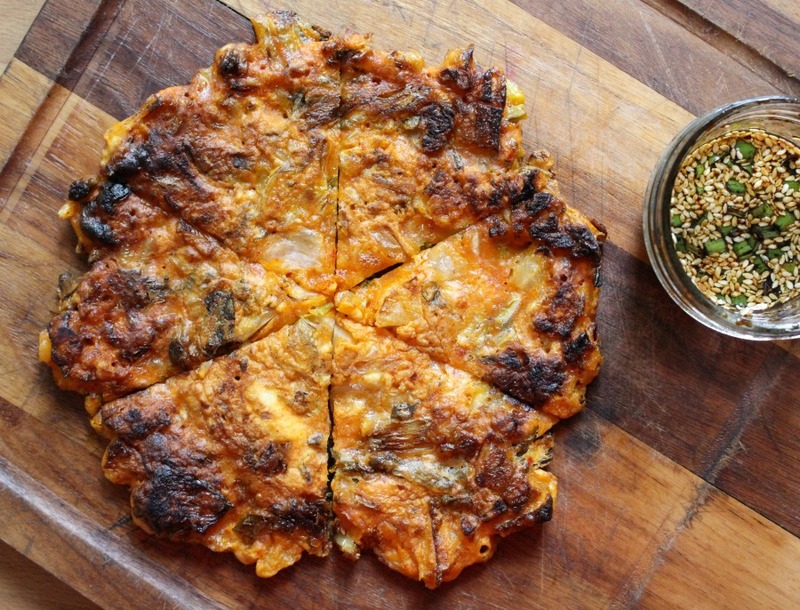 Pack along with your kimchi pancakes, for dipping.